Sunday was our last day. The plan when we woke up in Chicago, and had the last breakfast, the last morning swim, was to pack up and hit the road. Well, we were close. All of us went on this morning swim. That was a first, I had gone with the boys the day before, Eric had gone with them, but there were only a couple times we'd all 5 gone. And this was the best of them. The water was finally the perfect temperature, and the boys weren't very afraid. For his birthday, Sam picked out for Christopher a set of 'swimmy squids' that you can throw in the water, and they will slowly sink to the bottom. We brought them, and the boys were playing with them. I told them they could throw them where They could reach them, but if I had to get them out of some deep end where they couldn't reach, that was the end. They never did. Jacob really adored the swimmy squids. He held on to that orange one the entire first time we brought them out. And then he kept going after that one every time. Maybe his favorite color is orange? Ah, a couple foggy boys. Playing with the swimmy squids. Of course Sam's got the green one, and Chris has the blue. Their favorite colors, they had to have them. Time to go - I've got some boys to dry off. I didn't take my flower with me. I took a last picture of the carnation that the Red Knight had thrown me on Tuesday night at Medieval times. I'd put it in a cup of hotel water, at the boys' suggestion, and it actually opened up a bit more, and was looking pretty good after 5 days. I suppose I could have tried to get it home, I chose to not to try. We go the car packed up and all ready to go, and it was 10:30. So we decided to do something a little crazy. According to my Chicago map, there was The First McDonald's about 15 minutes away from where we were staying. It made perfect sense to grab some lunch on the road from the boys' favorite restaurant as a last hurrah in town. So we thought we'd stop at the First McDonald's in Des Plaines. Well, it pays to read the fine print. First of all, it is not the First McDonald's. 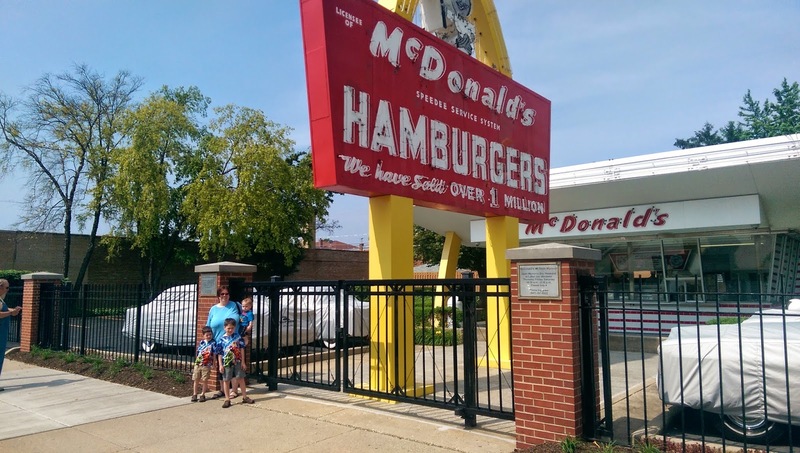 It's a rebuild of the first franchise stolen by Ray Kroc, from the original McDonald's brothers in California. This 'museum' wasn't even open on Sundays. So we looked through the gate, the kids weren't too disappointed, it looked old and they believed it. We posed in front of the golden arches. This fake mannequin in the window is a bit spooky. And a friend of mine said she used to wonder if the original hamburger is still on the counter. But otherwise it wasn't really worth the stop. And when we tried to drive through Store #1 (across the street) thinking that cheeseburgers from the first store might placate them, they were still serving breakfast...at 11 a.m. on Sunday. Forget that. So we got in the car and got out of town. It was no worry, goodness knows we had enough snack food in the car. We did that for 'lunch'. Or at least we decided we'd have lunch on the other side of Chicago. Then I got an idea, a grinchy awfully awesome idea. There's a Jamba Juice in Merrillville. All of us were ok with that. So, I drove us through all the crazy Chicago traffic, and we stopped to pee and for smoothies. Sam got a green one (with kale that he didn't like, so he switched with me) Chris got a strawberry banana thing, and I got something that tasted like a mango pina colada. Yeah I drank 1/3 of it, and gave it to Sam. But it was Good. We really need a Jamba Juice in Indy. Really a lot. We decide then our next stop would be Fair Oaks Farms for lunch. We had to stop for the 'World's Best Grilled Cheese Sandwich. When we arrived, apparently, they've opened a fancy sit down restaurant, just 2 days before. And we thought, Oh! It's 2 pm on a Sunday, we'll give it a try. Well, nope. A. There was a 45 minute wait (um, at 2? No Way!) and B. They didn't have Grilled Cheese on the menu. Well, forget that, so we went to the cafe where we usually go, and go our grilled chesses. All of us ordered grilled cheese. Perhaps I have been spoiled. This trip had been filled with amazing Chicagoan foods. I had been craving this grilled cheese for almost 2 years, since being pregnant with Jacob. But they changed the bread on the 'World's Best Grilled Cheese Sandwich', making it thus, less than the World's Best. It was still pretty good, but now that I can buy sweet swiss, right here in town at the Marsh, and put my own fabulous bread on it, I don't think it's worth it. They also charge an arm and a leg to do the cow and pig exhibits, which we don't care to see, but my kids used to love to just Play up there. Well, we told them, we were going for lunch, and that was all. They were ok with just that. Grilled cheese and chocolate milk. That was OK. It was not the be-all end-all that we remembered it being. Well, the chocolate milk is still phenomenal. Even Chris got a milk mustache! I'm not sure if we can get that here, but Trader's point chocolate milk is also pretty awesome. One of my favorite moments was when Sam and Daddy went to the cheese counter to try samples and pick out some souvenirs. Daddy got cheese curds. Yeah, they didn't even make it home. And Sam picked a nice butterkase. Because I got a call from my friend Amy, and she wanted to know if we'd like to pop by for a visit. Yeah, it had been a whole week and a half since Day Camp ended, and our kids were going through withdrawal. So we stopped at Camp Tecumseh on the way. My big boys "helped" her kids finish watching some show, then they all decided to go out and play. Even Jacob came outside to play a little bit. All the yahoos were having a good time. But Jacob wanted to go indoors, and bang on the doors, and get the heck out of those sandals that he stole from Jeremiah. I thought he was adorable in them though. After we finally got home, we bathed all three boys, because, well, they needed it. Jake had the best reaction of all. He was so happy to be bathing in his own bathtub again. It's good to get away, but it's good to come home again too.